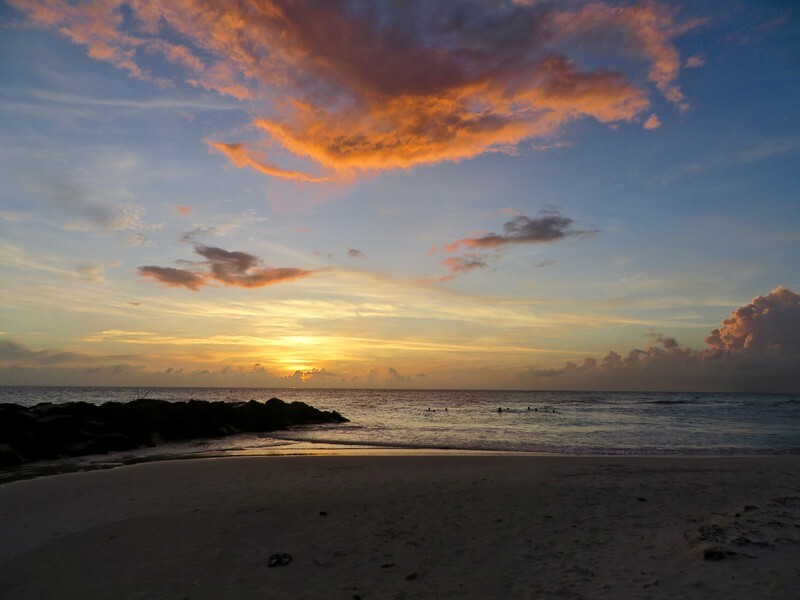 It had been a long time – think years – since my husband and I had taken a relaxing beach vacation, so when we made plans to visit the Caribbean for the first time, I decided I wasn’t going to overthink the trip. No itinerary. No carefully studied travel guides. No restaurant reservations. 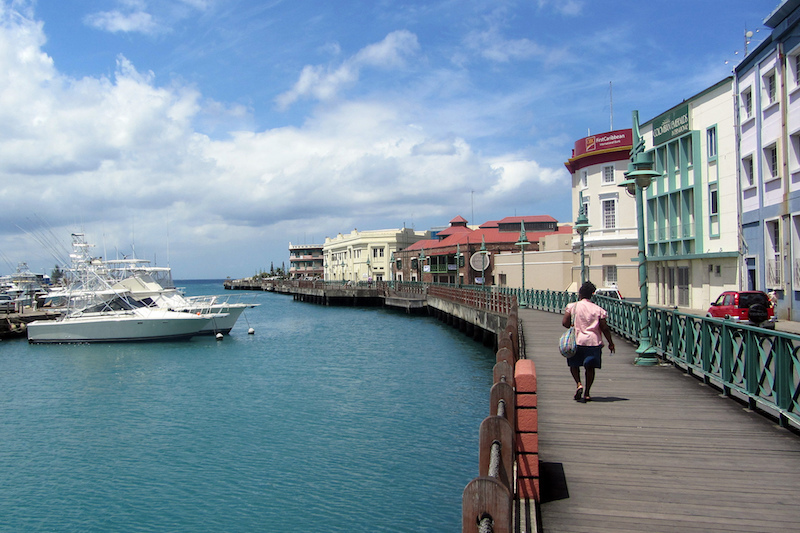 We weren’t expecting much from Bridgetown when it came to food because it was the beaches that we were there to see. As it turned out, leaving dinner to chance paid off – big time. Our first morning at our hotel in Needham’s Point, we meandered down to the beach with the thought that we’d snap a few pictures and then head back to the concierge to book our activities. But the lure of that blue-green water, especially for two sea-starved land lubbers, was too much, and before we knew it, we were peacefully parked in lounge chairs, doing nothing but watching crabs race across the sand. Vendors began approaching selling everything from photos with monkeys to weed. 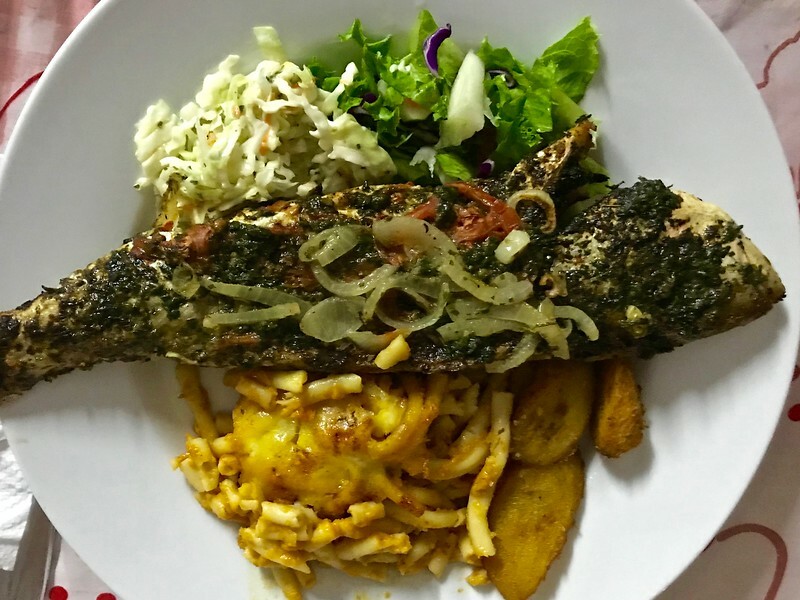 We casually asked one for a dinner recommendation, and he told us that if we were feeling adventurous, we needed to hop in a cab and head to Oistins Fish Fry, which happens every Friday night. Always up for an adventure, we took his advice (when our concierge warned us about crowds of rowdy locals, it only solidified the plan). The fish fry is located in the town of Oistins on the southern edge of the island. It’s basically scores of stalls serving up plates of marlin, flying fish (the national dish), king fish, red snapper, and ice-cold Banks beers. We shared a picnic table with some British tourists and dove into a plate of fried fish with heaping sides of peas and rice (brown pigeon peas and spicy rice – delish) and macaroni pie (baked macaroni and cheese topped with even more cheese – not my favorite). We washed it all down with Banks beers, and the entire meal cost less than $30USD. All around us, Bajans, as Barbados residents are called, played games of dominos. There was music everywhere, and the sidewalks were filled with locals selling salt bread from pushcarts, kids eating enormous ice cream cones and a handful of gawking tourists. It’s sensory overload, and we loved it. At Pebbles Beach on the west side of island, we found the legendary Cuz’s Fish Shack. It’s a bright blue-and-yellow stand in the beach parking lot where people line up in droves for fish cutters, a slider-sized, lightly fried, marlin sandwich topped with lettuce and tomato (you can also order it with cheese and an egg). Doubtful that something that basic and seemingly touristy could possibly be worth it, we headed to the parking lot for lunch, only to find we were the only people around (another bonus to visiting the island in October). We ordered two fish cutters with cheese, took a seat on top of a chest cooler and stared at one another wide-eyed after our first bites. I can’t exactly put it into words, but the combination of the fresh fish and pillowy bread was one of the best things we ate on Barbados, or anywhere for that matter. My husband says he could have eaten at Cuz’s every day of our trip and never gotten tired of it. At only $5USD per sandwich, we probably would have saved some money, too. It’s worth it to note that Cuz’s hours seem to vary, but while we were visiting, it was closed on Saturday and Sunday. It’s also currently the second highest-rated restaurant in Bridgetown on TripAdvisor. In my opinion, if you miss this spot, you miss Barbados. To me, there’s something a little off-putting when you make a dinner reservation only to be told what time you need to vacate your table, but with ocean views like the ones at Tapas in Christ Church, I suppose that’s to be expected. Nonetheless, we settled into our high-top, linen-clad table shortly after sunset, our two-hour window looming over our head. True to its name, the restaurant specializes in small plates, and we enjoyed the beef carpaccio to start ($16USD). It was one of our favorite bites of the night: thinly sliced Angus beef topped with Parmesan shavings and truffle oil. The Thai fish cakes with sweet potato ($8USD) were a close second – we ordered two rounds of that one. You can’t go wrong with the salt and pepper shrimp ($8.50USD), either. The tiramisu dessert ($12USD) arrived in an Instagram-worthy tulle basket and was a great way to end the night (just in the nick of time, I might add). For our last night on the island, the tour desk operator recommended Champers. It’s where the locals go to celebrate special occasions, she whispered confidentially. It also books up months in advance, so we were lucky to get a last-minute reservation and even luckier when the hostess led us to a table on the terrace perched above the water. Romantic lanterns lit the area, and we knew right away that we were in for a treat. First, there’s the excellent wine list. We were prepared to find plenty of sugary rum cocktails on Barbados, but we weren’t prepared for the lovely wine menus we discovered at many of the restaurants. We ordered a bottle of Sancerre and started with the slow-roasted pork belly appetizer ($21USD). The parmesan-crusted barracuda ($33USD) and Cajun mahi mahi ($34USD) with its pepper jelly dressing are also highly recommended. Yet I think the menu item that I’ll always remember most was the coconut pie ($12USD), partially because it’s not something we would ever order back home. But Barbados is known for its coconut pie, and this has to be one of the best. It comes with a side of coconut ice cream, and it’s topped with a palm-tree-shaped cookie. Forgive me for speaking in clichés, but it tasted like paradise. If you are looking to splurge ($150 per person – a bargain for what you receive), I highly recommend booking the six-hour semi-private cruise on Cool Runnings‘ luxury catamaran. You’ll sail up and down the west coast of Barbados, stopping two or three times to snorkel with sea turtles. In between dips in the water, the staff will make sure your wine/beer/cocktail glass is never empty. Ever. And we’re not talking bottom-shelf booze, either. When they found out I had a penchant for French rose, it magically appeared and seemed bottomless. So did the bottle of single-malt Scotch for my hubby. The coup de grace was the onboard chef. As soon as we set sail, he went to work on a multi-course lunch for the 15 or so passengers lounging around the boat. 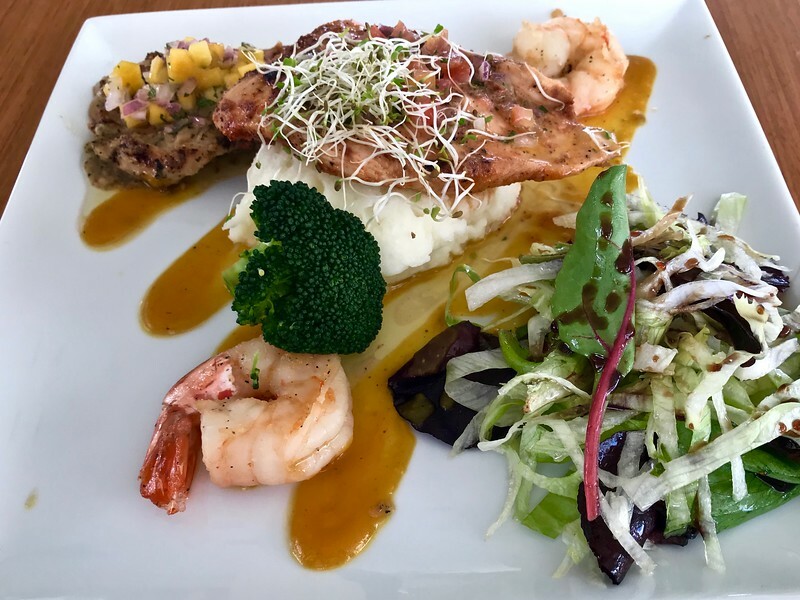 The menu changes constantly, but our main dish featured chicken, fish, shrimp, salad, and mashed potatoes. The rest of the passengers seemed to all know each other, so we left the boat deck to them and gathered in the dining area in the cabin where we could watch the chef create his masterpieces. It might be the rose talking, but it was one of the most relaxing – and opulent – days I’ve ever had on vacation. 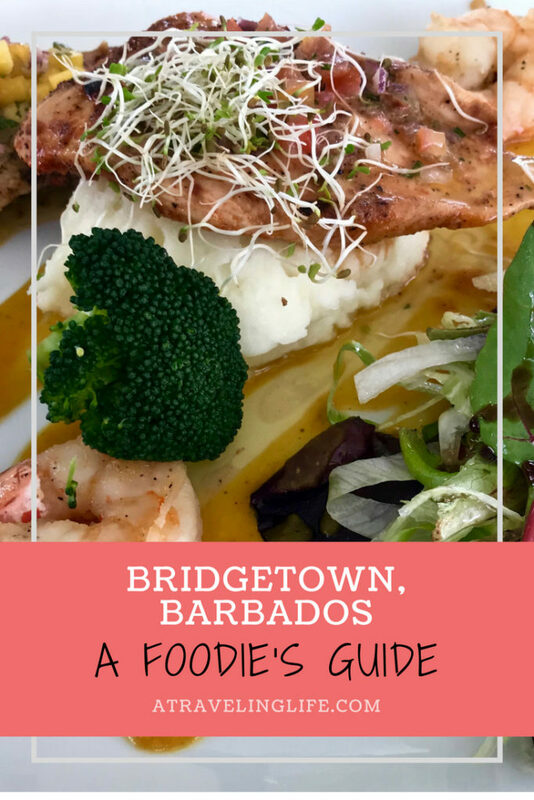 What do you think are the best places to eat in Bridgetown? This is the seventh post in the “My Favorite Food Town” series. Check out the previous post on Rovinj, Croatia. I’m from Barbados but live on the South shore of MA. You’ve shown me dishes that I’m unfamiliar with , but will try in a few weeks . Thanks. Thanks for reading! So glad you got some inspiration for your upcoming travels. And yes I love Portugal and would be happy to give you some advice – I’ll reach out via email. Thanks for reading, Laura! So glad it was helpful!